(by Eileen Dombrowski, from OSC blog Sept 13, 2014) About all areas of knowledge, we ask questions that take us straight to methodology and social context. Who owns knowledge? How is it passed on as shared knowledge, and within what controls of methodology or power? We may think instantly of the sciences, and even controversies over current scientific conclusions and scientific products (e.g. medicines and technologies). Yet some of the oldest knowledge in the world is equally ignited by these knowledge questions, which burn hotly in our news. As Indigenous Knowledge joins the other categories in our TOK areas of knowledge, it brings living issues of definition, historical and social context, and control of what knowledge is taught to the next generation. In Canada this week, more controversy has erupted over an agreement between the Assembly of First Nations and the federal government over a bill on First Nations education. In dispute have been the degree of First Nations control of aboriginal education and the extent of federal funding. In play has been the question: Who controls the knowledge that will be passed on to the next generation in a schooling system? More specifically, what extent do aboriginal people decide their own schooling, and to what extent the government? Both the content of the bill on education and the process of reaching apparent agreement in February (now contested) are subjects of controversy. Who controls First Nations education? This is no lightweight question. It was only last spring that the Truth and Reconciliation Commission concluded four years of hearings into Canada’s residential schools and their “cruelty and abuse” of native children forcibly separated from family and culture. In 2007, Canada made a formal apology for the residential school system and the damage it has done to aboriginal peoples. The historical justification for residential schools (from the perspective of the federal government) was to educate the children – educate them away from Indigenous Knowledge passed on culturally and toward European knowledge passed on in a residential school — knowledge that would integrate them and make them easier to manage within a dominantly European society. With some awareness of this historical background (which varies with the part of the world), we can ask some of the leading questions about Indigenous Knowledge (IK) with greater understanding of the significance of what we consider to be the answers. 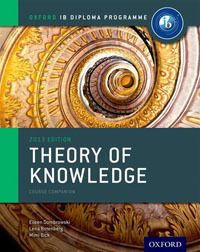 Although I have treated major knowledge questions already in the IB Theory of Knowledge Course Companion (chapter 21) and don’t want to repeat a lot here, I would emphasize the following as applicable to what is happening right now in our news. All of the following questions are connected, in one way or another, to the central concept of definition – and the implications of how we name our concepts and draw their boundaries. 1. WHAT is “indigenous knowledge”? Do we define IK by describing its most usual traditional characteristics, such as experiential knowledge of living on a particular land or the holistic nature of much indigenous knowledge, such that dividing science, religion, and the arts into separate areas makes no sense? Is the definition affected by WHEN the knowledge was gained and WHO gained it? 2. WHEN is “indigenous knowledge”? Is it something of the past that ended historically with Contact – such that it is either “preserved” or “lost”, but not current and evolving as other areas of knowledge are (and as IK had been prior to the instant-freeze moment of Contact with Europeans)? As indigenous people continue to learn, create, and communicate, is their new contemporary knowledge excluded from the category of IK? 3. WHO has, or can have, “indigenous knowledge”? IK is different from most of the other TOK areas of knowledge. Scientific knowledge, or historical knowledge, or knowledge in the arts is open to people of any ethnic background (even though they may bring influences from their backgrounds). But indigenous knowledge is tied explicitly to particular ethnic groups as cultural knowledge – groups classified as “indigenous”. The relationship is intimate between their knowledge and their identity. Yet to what extent do the indigenous groups around the world present a commonality, and to what extent difference? And how does the degree of variability of indigenous cultures and what they know affect what we consider IK to be? If you answer question #1 by insisting on traditional features of Indigenous Knowledge, and answer question #2 by placing Indigenous Knowledge in the historical pre-Contact past, then you will probably find the current First Nations responses to educational systems irrelevant to the Theory of Knowledge course – except insofar as traditional knowledge is preserved or lost by the contemporary people of question #3. However, if you answer question #3 by saying that IK is the knowledge held by indigenous people and recognize First Nations to be historically continuous, then you will accept that, over the past couple of centuries, their knowledge (like everyone else’s) has changed. You will notice that they often have strong feelings about the education they consider currently best for their children – just like other parents and community leaders in the world – regardless of whether or not the educational issues centre on the preservation of traditional knowledge. And, if you think of what many in the present generation of adults suffered in the residential schools, you can understand why they do not fully trust the government to know what’s best for them. You may also be more inclined, perhaps, not to think of indigenous people – or even one cultural group of indigenous people – as holding a homogenous perspective on knowledge and schooling. Just for example, the Assembly of First Nations has been politically divided over the process of ratifying the educational bill that their Chief signed. Many felt strongly that a meeting with the government should be on their terms, as nation-to-nations, in the presence of the representative of the Crown – not in the Canadian capital of Ottawa between the National Chief and the Prime Minister. The National Chief resigned in May in face of protests over his style of leadership, and this week’s controversy centres on the degree to which he included — or failed to include — other chiefs in the process of reaching the contested agreement in February. Is background political disagreement between indigenous leaders on a federal bill, though, relevant to IK in the Theory of Knowledge course? That depends on the definition you accept of IK. If indigenous knowledge is what indigenous people know, and if the process of sharing knowledge from one generation to another includes the system they accept of schooling, then the answer is yes (even though in TOK we ensure that we keep our focus on the knowledge and don’t get overly absorbed into its sociology and politics). Actually looking at the people themselves does make Indigenous Knowledge messier to treat in TOK: it becomes harder to make generalizations as cultural groups change over time in their knowledge, and harder to cut out of the picture the complex social and political forces of past and present. In my mind, however, IK is all the more interesting for its shifting cultural context, multiple perspectives, and contemporary debates over control of educating the next generation. If we can recognize IK for its traditional achievements and at the same time see it within its contemporary context, then we take a major step toward appreciating the living human processes of passing on knowledge — not just Indigenous Knowledge but all other knowledge as well. This entry was posted in IB Theory of Knowledge and tagged definition, implications, indigenous knowledge, perspectives. Bookmark the permalink.